The Aurora Prize Selection Committee announced the four Aurora Prize finalists as Marguerite Barankitse, from Maison Shalom and REMA Hospital in Burundi; Dr. Tom Catena, from Mother of Mercy Hospital in the Nuba Mountains of Sudan; Syeda Ghulam Fatima, the General Secretary of the Bonded Labor Liberation Front in Pakistan; and Father Bernard Kinvi, a Catholic priest in Bossemptele in the Central African Republic. The Aurora Prize for Awakening Humanity is a new global award that will be given annually to individuals who put themselves at risk to enable others to survive. Recipients will be recognized for the exceptional impact their actions have made on preserving human life and advancing humanitarian causes, having overcome significant challenges along the way. One of the four finalists, the ultimate Aurora Prize Laureate, will receive a grant of US$100,000 and the chance to continue the cycle of giving by nominating organizations that inspired his or her work for a US$1 million award. The Aurora Prize was created by the co-founders of 100 LIVES, a pioneering global initiative seeking to express gratitude to those who put themselves at risk to save Armenians from the Genocide one hundred years ago. On behalf of the survivors of the Armenian Genocide, the annual Aurora Prize aims to raise public consciousness about atrocities occurring around the world and reward those working to address those issues in a real and substantial manner. Marguerite Barankitse, from Maison Shalom and REMA Hospital in Burundi, saved thousands of lives and cared for orphans and refugees during the years of civil war in Burundi. When war broke out, Barankitse, a Tutsi, tried to hide 72 of her closest Hutu neighbors to keep them safe from persecution. They were discovered and executed, whilst Barankitse was forced to watch. Following this gruesome incident, she started her work saving and caring for children and refugees. She has saved roughly 30,000 children and in 2008, she opened a hospital which has treated more than 80,000 patients to date. Dr. Tom Catena is the sole doctor at Mother of Mercy Hospital in the Nuba Mountains in Sudan. An American physician, Dr. Catena is the only doctor permanently based near the country’s border with South Sudan, and is therefore responsible for serving over 500,000 people in the region. Despite several bombings by the Sudanese government, Dr. Catena resides on the hospital grounds so that he may be on call at all times. His selfless acts have been brought to light by a number of media and aid organizations, and he was named one of TIME’s 100 Most Influential People in 2015. Syeda Ghulam Fatima has worked tirelessly to eradicate bonded labor, one of the last remaining forms of modern slavery. Fatima is the general secretary of the Bonded Labour Liberation Front Pakistan (BLLF), which has liberated 80,000 Pakistani slaves who were forced to work for brick kiln owners in order to repay debts. The interest rates are too high for workers to pay off, trapping the workers in forced labor and poor—often brutal—conditions. Fatima has survived attempts on her life and repeated beatings during the course of her activism. Father Bernard Kinvi became a priest at age 19, after losing his father and four sisters to prolonged violence and illness. Father Kinvi left his home country of Togo to live in Bossemptele, a small town just inside the border of the Central African Republic, where he heads a Catholic mission which consists of a school, church and the Pope John Paul II Hospital. In 2012, civil war broke out in the Central African Republic between Muslim Seleka rebels and the anti-balaka (anti-machete) Christian militia. Amidst the violence, Father Kinvi’s mission provided refuge and health services to those on both sides of the conflict, saving hundreds of people from persecution and death. 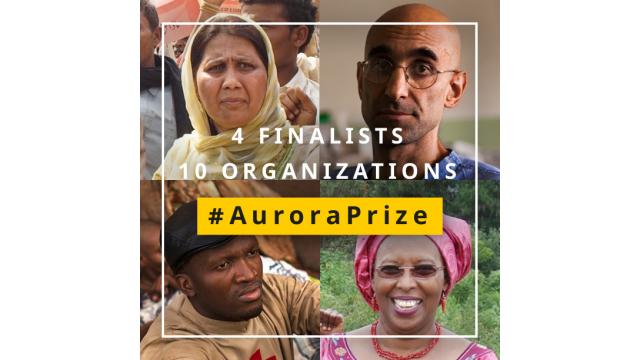 From July to October 2015, nominations were received from around the world through a public portal on www.auroraprize.com. Candidates were nominated for their selfless work, from battling bonded labor to harboring refugees, to delivering frontline care in conflict zones. One of the four finalists will be announced as the inaugural Aurora Prize Laureate during a ceremony in Yerevan, Armenia on April 24, 2016. Selection Committee Co-Chair George Clooney will present the award. The Aurora Prize finalists will be celebrated as part of a weekend of events bringing together leading voices in the humanitarian field, including the International Center for Journalists, International Rescue Committee and Not On Our Watch to discuss some of the most pressing humanitarian issues the world is facing today, and acknowledge those confronting them. 100 LIVES is a new global initiative rooted in the events of the Armenian Genocide, during which hundreds of thousands of Armenians were saved by the courageous and heroic acts of individuals and institutions. A century later, 100 LIVES seeks to express gratitude, to share remarkable stories of survivors and their saviors, and to celebrate the strength of the human spirit. 100 LIVES is an initiative of the IDeA Foundation (Initiatives for Development of Armenia), a charitable foundation committed to promoting socioeconomic development in Armenia through investments in long-term, non-profit projects. Further information is available at www.auroraprize.com. Recipients will be recognized for the exceptional impact their actions have made on preserving human life and advancing humanitarian causes. On behalf of the survivors of the Armenian Genocide and in gratitude to their saviors, an Aurora Prize Laureate will be honored each year with a US$100,000 grant as well as the unique opportunity to continue the cycle of giving by nominating organizations that inspired their work for a US$1,000,000 award. The Aurora Prize Selection Committee includes Nobel Laureates Elie Wiesel, Oscar Arias, Shirin Ebadi and Leymah Gbowee; former President of Ireland Mary Robinson; human rights activist Hina Jilani; former Australian Foreign Minister and President Emeritus of the International Crisis Group Gareth Evans; President of the Carnegie Corporation of New York Vartan Gregorian; and Academy Award-winning actor and humanitarian George Clooney. The Aurora Prize will be awarded annually on April 24 in Yerevan, Armenia. or login via ISEBOX - we value your privacy and will never post to your social profile unless you ask us to. Please enter the information below honestly. Your IP address is 10.189.245.15/54.226.73.255.